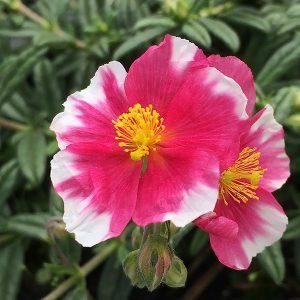 Helianthemum plants are also known as rockrose and sunrose. These are a group of evergreen or semi-evergreen shrubby perennials, enjoying a well drained sunny position. Species such Helianthemum nummularium look good hanging down over a retaining wall or in the rock garden. Most are used as ground cover plants, and as they grow well in difficult conditions, they are a versatile addition to the landscapers palette. Grown for the masses of colourful flowers as well as the foliage, the flowers vary in colour, and the foliage of different species also provides a fair variety. The name ‘Rock Rose’ hints at their hardy nature. They are a Mediterranean plant and thrive in hot sunny positions, as well a soils which are a little on the poor side. The flowers attract bees and birds to the garden, the plants are tough without being invasive, and care is minimal once established. Once planted and settled in these are a very easy care plant. Dig in a little well rotted compost. Ensure the soil is well drained. Weed around the plants, and mulch to prevent weeds and help retain a little moisture. Water through the first summer during dry spells. H. nummularium – Also known as the common rock rose, yellow flowers with orange stamens. Many cultivars with different coloured flowers. H. scoparium – A species from California and is a straggly upright species again with yellow flowers, not as showy as above. H. candense – Showy yellow flowers and deep green foliage. Cultivars such as ‘The Bride’ which has creamy white flowers on a bushy shrub, ‘Ben Fhada’, which is an excellent form with bright yellow flowers and a pronounced orange centre and ‘Sommervill Copper’ with its orange flowers and ‘Raspberry Ripple’ are all popular.